It was buried in the torrent of news from the San Diego Comic Con. It was none other than the announcement of an MMO based on my all-time favorite TV show. Star Trek Online, you say? No, that is already out, and Star Trek loses to this show easily. You mean they are making a Get Smart MMO, you ask? No, missed it by that much. They are making a Firefly MMO. It’s true. I can hardly believe it. It is coming out on Android and iOS first, with tentative plans to expand to other platforms, and let’s face it, Fox isn’t in charge this time, so it is unlikely it will be cancelled. A) Rewatch all of the Firefly episodes and Serenity. B) Watch Castle (since I’ve been meaning to try it). C) Play my Gunslinger in SWTOR (which I do anyway, but still). 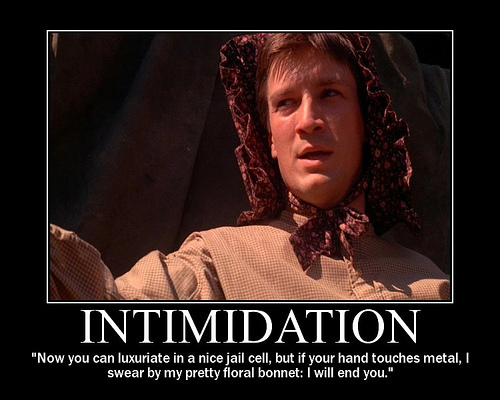 Here is a fun tidbit of references to Firefly in Castle that I found online. Enjoy! And before people get on my case with my favorite TV show, Star Trek is definitely up there, but it doesn’t have Adam Baldwin or the “space cowboy” feel. Get Smart is one of my favorite shows, but it gets very homogenous after a while. Big Bang Theory is the only show I would dare to call my favorite that is currently running, but I think Sheldon would approve of me ranking Firefly higher! Firefly has the sci-fi feel I love in a TV show, plus a healthy dose of Western flair (which pleases the Texan in me greatly). It has a completely original vernacular that really solidifies the era of the show and helps suspend disbelief. It helps you get engrossed in the show because the vocab is so different. Oh, and my favorite thing about Firefly? There is NO SOUND IN SPACE!!!! That is all. Rigid Race/Class structure 😛 Bad joke. Hahaha, actually now that you put it that way, that’s a perfect joke. Sorry, I should have gotten that, but I am knee-deep in writing my masters thesis, and computers aren’t cooperating, so my brain is fried lol.